The delicate raised floral pattern of Artemis on white bone china is reserved for extra fine dining. 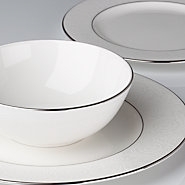 Trimmed in shimmering platinum, the 3 piece place setting includes dinner plate, salad plate, and bowl. Dishwasher safe. Diameter of dinner plate: 10 3/4"; salad plate: 8"; bowl: 6 1/2"
Capacity of bowl: 24 oz.